Hope you're having a good week so far! 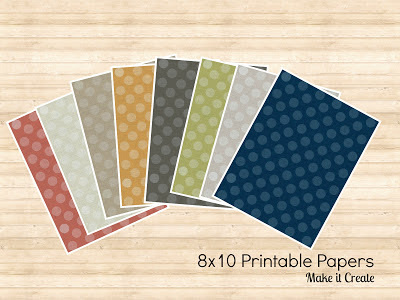 Today we're adding a pack of printable papers, 8x10 in size, free to download!! Use these to create your own printables...or crop to create banners, labels, invites, etc! The polka dot design was created in Illustrator, then a linen texture was added to each in PicMonkey! Click HERE to download the paper pack! Download all 8 or just your color choices! Be sure to check out our shop also, it's full of papers like these! We've got chevron, quatrefoil, damask, and more. Choose from smaller instant download 5 packs, or larger packs up to 50 papers!! Find something for a current project, or stock up for many projects to come. Click HERE to head to our shop! If you aren't already, follow us via Facebook/Twitter/Pinterest and stay updated when more freebie downloads like these come available. We've got lots more to share! Thanks for the prints. Love the pattern and colors. I love your site and I'm a new follower! So glad I found this and I love the patterns! We're so appreciative of your comments! Thanks so much for visiting! Download issues? Make sure that you are clicking on a file inside our download folders before clicking the download button! Using the "download" button before clicking on a file will not work, since the whole folder cannot be downloaded. Must download each file found in the folder separately. Make sure to click on a file in the folder first, then click on "download". Enjoy the freebies! !